Graphite usually suggests pencil drawings made up of strokes and lines, but in "Gerald Auten: Graphite Insomnia," currently on view at the White River Gallery in South Royalton, the artist uses powdered graphite or graphite pencil to build images very differently. Using his fingers and tools, and wearing a respirator mask, Auten creates drawings that are part rubbing and part taping; the result is a mesmerizing confluence of surface buildup and erasure. 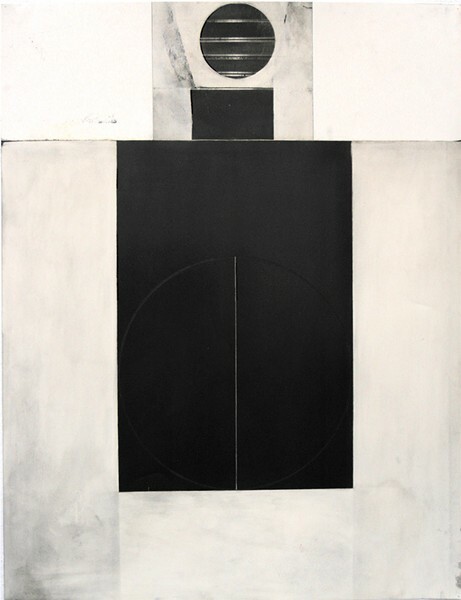 Auten's 15 abstract graphite drawings don't reveal the source of the "insomnia" in the show's title, or whether this body of work is the cause or result of it. If this is the stuff of sleepless nights, it is as beautiful and elusive as dreaming itself. 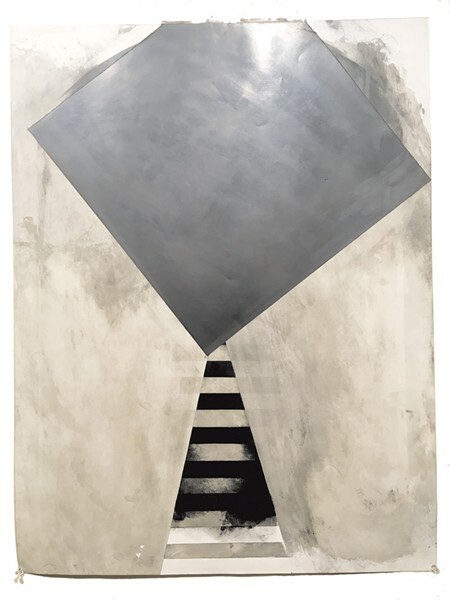 Auten's works are reminiscent of architectural blueprints — not surprising, since he studied architecture and teaches it, along with studio art, at Dartmouth College. 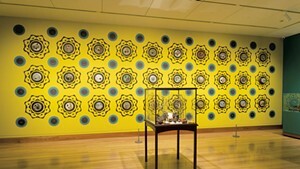 Auten also directs Dartmouth's Studio Art Exhibition Program. His own studies took place at the University of Iowa, Washington University in St. Louis and the University of Wisconsin-Milwaukee, and he has exhibited widely in the U.S. and abroad. Auten's drawings are two-dimensional, yet, whether geometric abstractions or recognizable objects, his images seem to emerge sculpturally from the flat surface. White space is a critical factor, playing foil to the "black holes" of darkness. In this exhibit, bright white lines puncture dark shapes, and hard-edged angles constrain velvety blurs. In the 24-by-18-inch "Auten," soft puffs of gray seem to materialize from the paper. "Bothe's Farm" (12 by 9 inches) is a veritable blizzard of gray and intense black filling almost three-quarters of the page; a horizontal line separates it from the white space of the remaining quarter. Auten's shades of gray are not limited to 50. 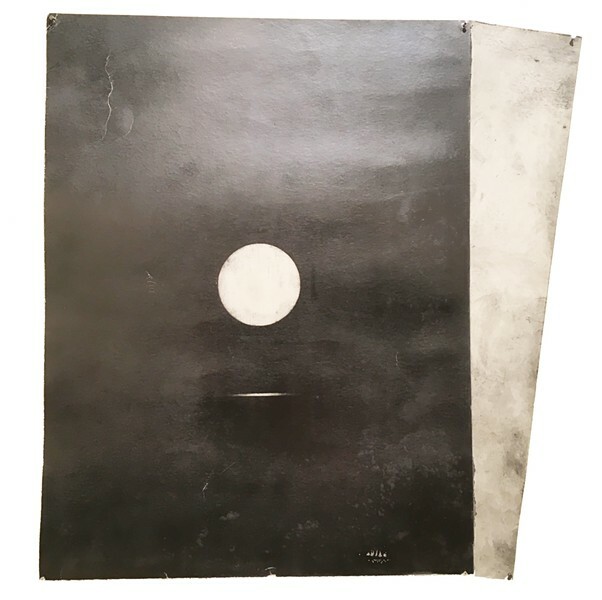 The artist uses dense, smooth, hot-pressed paper (or sometimes the backs of old posters or postcards), which has the right surface for working with his preferred medium. He adds bonding elements such as WD-40, turpentine or linseed oil to the powdered graphite and buffs the surface of the paper repeatedly, creating a highly polished effect. The process of applying coat after coat, then buffing, can take months. The resulting work is deeply saturated, illuminated at times by bright white. In some drawings, the black is so intense it feels like one could dive into it. Often the images seem to be something, yet that thing is as ephemeral as the "smoke" that appears to float on the surface of "Auten." This self-titled (self-portrait?) drawing consists of a dark black square that seems to hover just above the centerline. Two white lines — one horizontal, one vertical — form a cross in the center of the square, making it appear lit from behind. A cloud of gray emanates from beneath it. 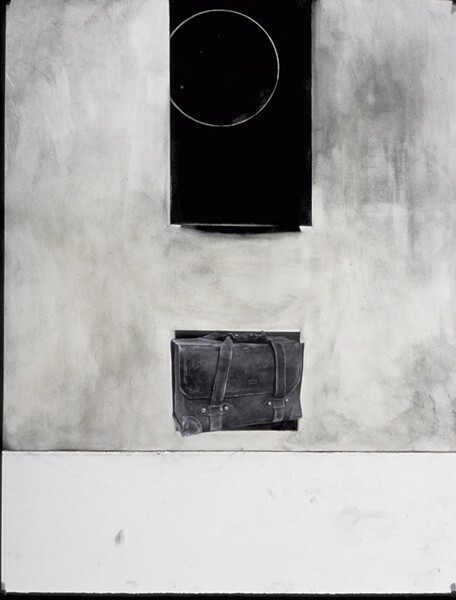 While Auten's drawings are abstract, some include recognizable elements, such as a suitcase. Sometimes these elements lend themselves to multiple interpretations. In the 40-by-26-inch "Insomnia," is that a man's white shirt and striped tie? Or perhaps a man is wearing it, his head represented abstractly by a square, his neck rising from the stiff points of the collar below. But wait — maybe it's a partially opened box or envelope, or an aerial view of railroad tracks disappearing beneath an overpass. Auten holds us in thrall, not knowing exactly where we are or what we're seeing. The title "Insomnia" could reference that state between waking and sleeping and the artist's experience of it. Or the exhibit itself could have resulted from bouts of sleeplessness — and creativity. Curator Dian Parker describes Auten as "a very flexible person. He likes to change things up." She notes that the drawing titled "Insomnia" actually "began the other way." That is, Auten started the work upside down, as it were — a 180-degree rotation from the completed work we see. Perhaps the shift indicates his interest in creating a sense of disorientation, rather than referencing a specific image. The drawings have a formal, austere quality, but Parker observes that Auten's sense of humor is also evident. "For me, these works have a wonderful silent quality and humor," she says. "It's silent; it's deep. It's warm and cool. There are contrasts: Is it an opening, a space or an object? Is this a rectangle or an entryway?" While many of Auten's drawings include plentiful white space above and below an image, he doesn't use it to "float" the work on the paper. The negative space is an intentional part of the drawing, and it's not always white. 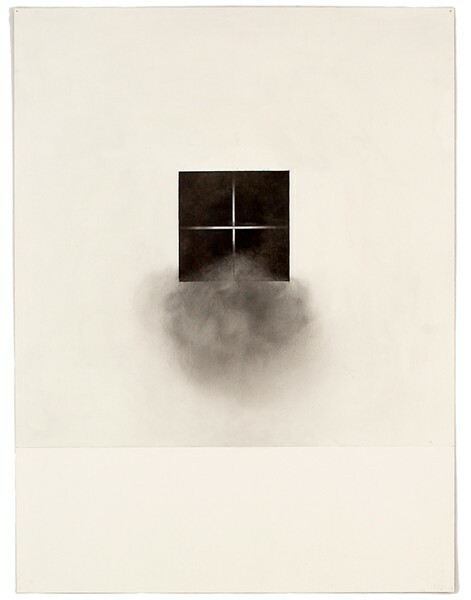 Given its close proximity to the graphite, it can appear gray (and often gray has been added), contributing to the atmosphere that Auten imparts to each work. The edges of his shapes are impossibly sharp and crisp — a technique he achieves in part by using archival artist tape. "He's a master at manipulating the graphite," Parker says. Graphite powder can be toxic, so Auten uses a mask and gloves as well as excellent ventilation. Is graphite the thing that keeps Auten awake at night? Do images in his dreams lure him from sleep? Whatever its genesis, "Graphite Insomnia" conveys the work of a fertile mind and the exacting pursuit of a vision. The original print version of this article was headlined "Nifty Shades of Gray"